Home › World Mission’s Southeast Consultation asks: Where do we go from here? 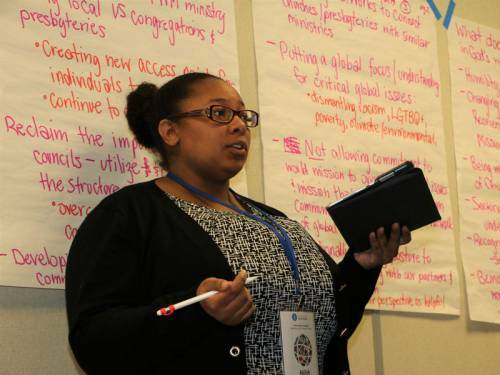 World Mission’s Southeast Consultation asks: Where do we go from here? 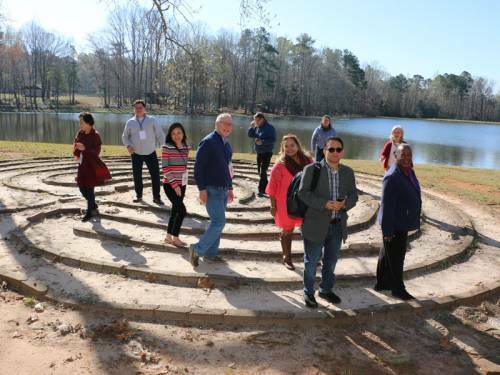 ATLANTA — During the first of three U.S. partner consultations, more than 30 supporters of Presbyterian World Mission came together last week by invitation to discuss and discern God’s mission in a rapidly-changing world. The Presbyterian World Mission Southeast Consultation, held at the Calvin Center near Atlanta, followed four international global partner consultations in Nairobi, Kenya (Africa); Berlin, Germany (Europe and the Middle East); Chiang Mai, Thailand (Asia and the Pacific) and Cartagena, Colombia (Latin America and the Caribbean). 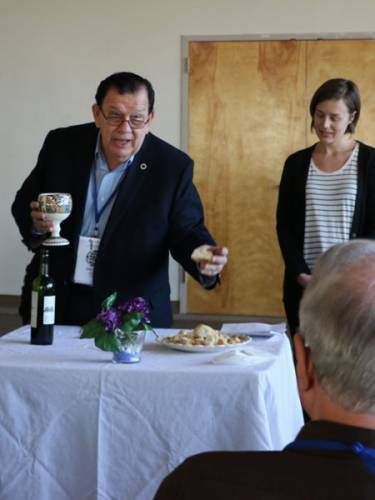 “We are thankful for the witness of our people in the pews,” Casal told those gathered. “We are proud of the witness of our partners in other parts of the world and in the United States. We give thanks to God for each of you who are here to be part of this process. She clarified that this isn’t an accusation against World Mission as much as it is a recognition of the fact that it isn’t just World Mission doing mission, “which is part of the plus and minus for us as Presbyterians right now,” she said. 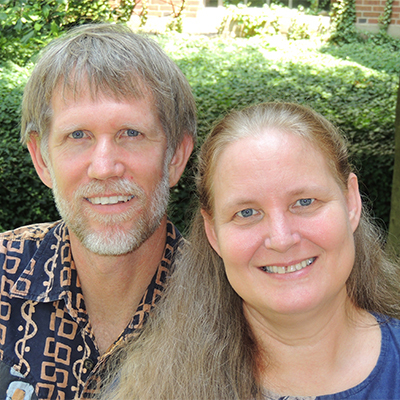 Sanders described his journey from cradle Presbyterian at First Presbyterian Church of Atlanta to seminary “to figure out what I believed,” to being ordained to mission service with his wife, Elizabeth, in a Palestinian village in the Northern West Bank for four years, to working in the Middle East office at the PC(USA) headquarters in Louisville for a short time, to serving as the pastor of a congregation in northeast Atlanta for 11 years, to a period of restlessness three years ago. This “restlessness” led Sanders to organize a 1001 New Worshiping Community, which currently exists as an Art, Inspiration, Justice podcast in Atlanta. He left behind a full-time job with a full-time salary, benefits and a pension. “Now I’m part of the ‘gig economy,’” he said. Sanders asked participants to pair up for an exercise he called, “Yes, and …” where, regardless of the over-the-top suggestion of the partner, the answer is “Yes, and let’s also (fill in the blank).” The initial suggestion switched back and forth between the pairs and the suggestions and additions brought creativity and laughter to the table groups. Northeast and southwest consultations are scheduled for Stony Point, New York, April 4–6, and Zephyr Cove, Nevada, May 10–12. These international and domestic consultations will be followed by a Presbyterian Mission Agency staff consultation at the national headquarters in Louisville in June. All eight consultations, along with a regional liaison gathering held prior to the consultations, will bring together a total of more than 700 partners, supporters and mission personnel to inform the next strategy for Presbyterian World Mission. The Rev. Dr. Joanne Sizoo, coordinator of the Iraq Partnership Network, created a Facebook group where participants in the 2019 Regional Mission Consultation Group Southeast can continue to share ideas about mission. Mission co-worker in Democratic Republic of Congo.